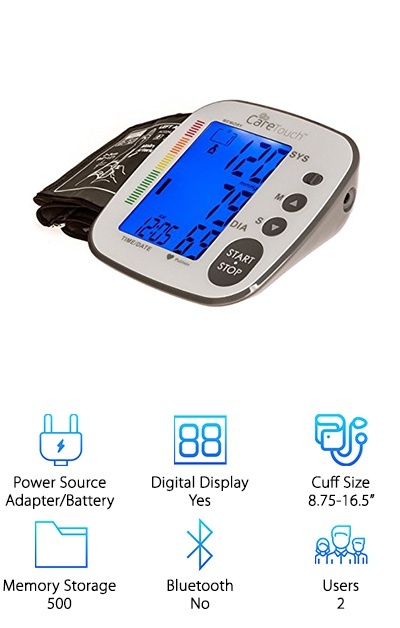 Whether you just want to keep track of your blood pressure or it’s been requested by a doctor, there are great blood pressure monitors available out there for purchase. Your health is important, so we researched the top 10 blood pressure monitors available to help you find the one that works best. The result is the excellent list below. Now: Before we get moving on the reviews, there are a few things you need to be aware of as you shop. Power Source: Do you need to be mobile with your blood pressure device? We will let you know if it comes with an adapter, a battery-powered option, or other energy sources. You can find monitors better suited for home, and for the road. Digital Display: A blood pressure monitor with a digital display may be what you need. They are easy to read, especially if you have to take multiple readings daily. We’ve marked whether the monitor you like comes paired with a digital display. Cuff Size: Cuff size can vary, so we’ve made it easy to check if the medical device you’re looking at will fit you. We’ve marked the range of the monitor cuff in inches. You’ll know if it can be placed on your arm. Memory Storage: Is it important to keep track of multiple readings as you use your blood pressure monitor? At a glance, you can see how many readings your device is capable of storing. Others will provide additional storage with an app! Bluetooth: Bluetooth capability in your blood pressure monitor means there is one less step you need to take during every reading. The numbers are transmitted wirelessly to an online dashboard for review. A digital record is instantly available! 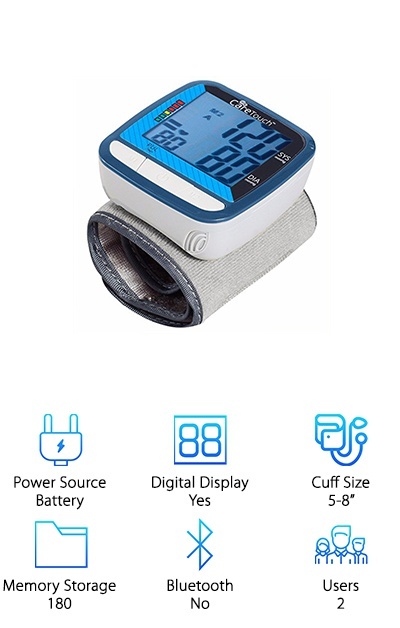 Users: There may be multiple people in your household looking for the best blood pressure monitor for home use. Some of the monitors we chose to accommodate more than one user, so you don’t have to buy several machines. 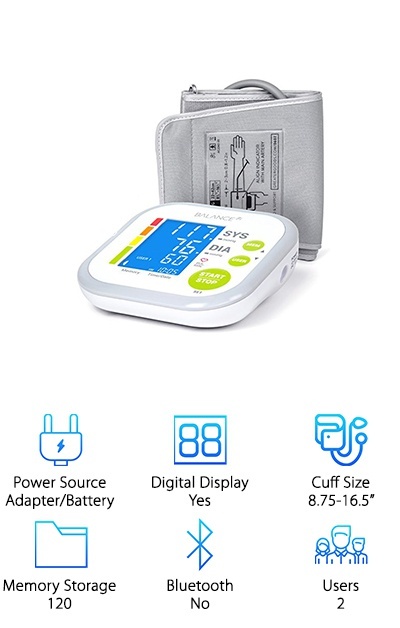 Now that you know what to look for, it’s time to browse our awesome top ten list for the best at home blood pressure monitor. We’ve got so many great choices to share with you! So let’s get right to the reviews. Here’s the deal: If you’re short on time, no problem. Just check out our top pick and our budget pick. Both are excellent alternatives for home health care. The remaining 8 selections are underneath. Let’s get started! Our top pick is the Omron Wireless Cuff. 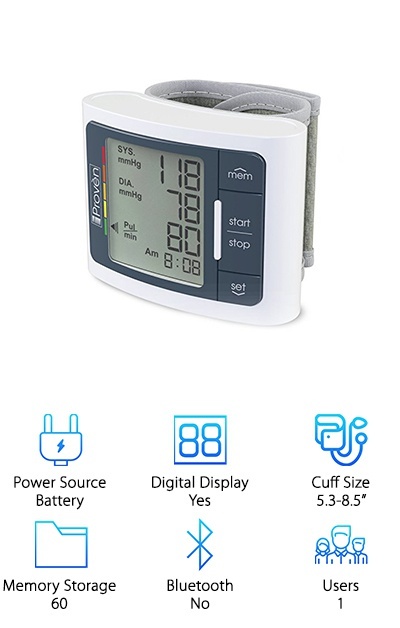 You have many medical device and blood pressure monitor choices for home use, and our reviewers think the Omron deserves to be number one. 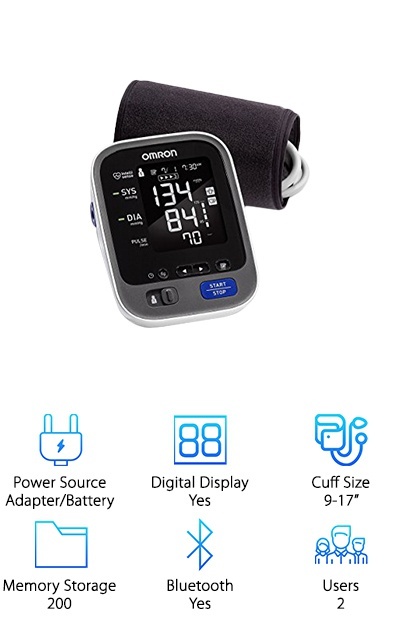 This can be considered the best Omron blood pressure monitor out there for a few reasons. First: it’s smart! What does that mean? This cuff is connected by Bluetooth. Any reading you take can be transmitted wirelessly to your home computer, laptop, tablet or smartphone, where every single number is saved for review. It’ll be that much easier to get the information to your doctor. In addition, the device itself stores 200 readings. Two users can be accommodated, so 100 readings can be stored for each person. That’s not all: the cuff has a wide fit range, between 9 and 17 inches. It should work for people with both medium and large upper arms. This cuff comes with an adapter, or it can run on batteries. Our budget pick skimps on cost, not accuracy. Omron is one of the top-selling monitor brands for a reason. 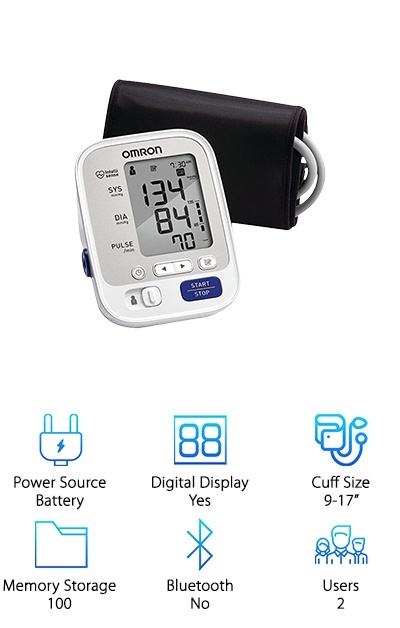 This is the Omron BP742N 5 Series Blood Pressure Monitor. You can purchase this for home use for two people! A handy digital display gives you your blood pressure figures, and memory storage will hold up to 100 readings. The technology in this little device will give you the average of the three readings taken in the last ten minutes. It will alert you instantly if an irregular heartbeat is detected, offering you valuable peace of mind. This monitor runs on battery power, so it’s easy to take it wherever you go. It will fit a wide range of arm sizes with its 9-17 inch cuff. Just place the cuff around your arm, and hit “Start.” The last thing you want to worry about is inaccurate readings. The BP Level Indicator will tell you how your numbers compare to home blood pressure levels. Spiderman has webbing that shoots out of his wrists, making leaping from tall buildings a breeze. Get your own superpower with the Care Touch Automatic Wrist Cuff for blood pressure monitoring. Here’s how it works: This cuff goes on your wrist, not on your upper arm. It has a size range of 5-8 inches. It can get you a reading in about one minute, and the device will average out your last three results. It gets better: This is an FDA-approved monitor. It has a clear LCD display, so you won’t have to squint to get your digits. Two people can share this monitor, and it will store up to 90 readings per person. Batteries are your power source here, and the machine will power off automatically to save energy. It will also tell you when new batteries are needed. Just get into the proper position, relaxed with your wrist at heart level, and your feet straight in front of you. At home or on the move, the LifeSource Pro Monitor is a wonderful selection. Here's what special about this monitor – the extra-large cuff size. While most cuffs will go up to 17 inches long for the upper arm, this one goes to nearly 24 inches. That means bariatric patients, weightlifters, and football players can use this device with ease. If monitoring your blood pressure at home seems intimidating, keep reading. The LifeSource Pro is made to make the process as simple as possible. Once the cuff is in place, the press of a button gets things started. There is also a Pressure Rating Indicator, an irregular heartbeat detector, and an extra-large digital display. Plug your monitor in at home to save on battery life. It will save the last 60 readings for you. Each will have its own time and date stamp, so looking back doesn't get complicated. Bottom line: simple is best for a quality home blood pressure monitor. With the right resources, monitoring your health at home can be a straightforward, stress-free process. That’s why our reviewers selected the Balance Blood Pressure Kit. This is a mobile unit, including both an adapter and four AAA batteries. It all packs up nicely into the provided carrying case. You might be wondering: why is this blood pressure monitor worth my time? Because it comes with everything you need. Greater Goods created a device with a simple, easy-to-read digital display. Here’s the scoop: There is a large upper-arm cuff, fitting arm widths between 8 ¾ inches and 16 ½ inches. You can easily measure systolic blood pressure, diastolic blood pressure, and your pulse. You can even share the Balance kit with a second user! The unit will retain up to 60 readings for each of you. This time-lapse glimpse capability can be truly helpful as you work with your physician. The monitor is automatic, so no pumping required! There are many reasons why people begin monitoring their own blood pressure, or the blood pressure of a loved one, at home. People with high blood pressure want to know that their readings are accurate, and their information will be easy to access and communicate to a doctor. 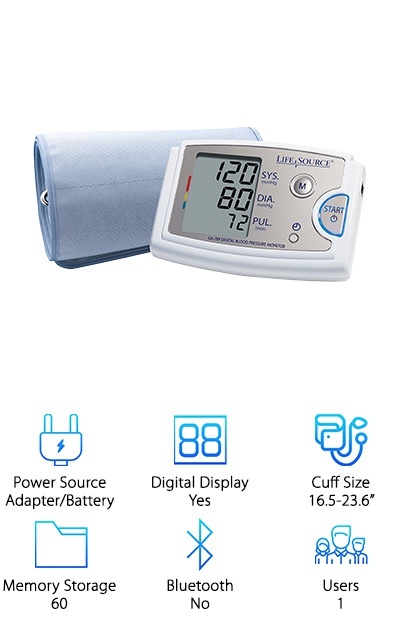 We chose the Care Touch Platinum Series blood pressure monitor using that logic! Think about it: you want top-of-the-line equipment available when it comes to healthcare concerns. 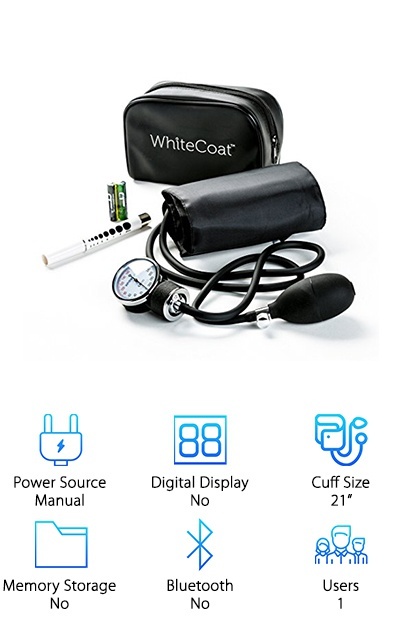 The Care Touch BP Monitor works off both an adapter and batteries, with batteries included with your purchase. The monitor's screen is angled and labeled clearly, so this digital display will not require a decoder. You will see both high pressure and low-pressure results, along with your pulse rate. There is a low battery indicator and an irregular heartbeat warning. It is FDA approved, too. This device fits a wide range of patients, with a cuff adjusting from 8 ¾ inches to 16 ½ inches wide. This FDA-approved wrist blood pressure monitor works very simply. It rests on your inner left wrist, taking your systolic and diastolic blood pressure along with your pulse. Like with any other BP monitor, you keep your arm at heart level as you get your numbers. As you can see, uncomplicated is a good thing in this case! And there's more: the Slight Touch Automatic has an enlarged LCD screen for reading your results. The band will inflate quietly and then continue on to store up to 60 readings each for two people. You've got your irregular heartbeat and low battery level indicators, too. The batteries for running this monitor are included, along with a nice carry case for when you're not using it. With only a couple of buttons and automatic functions, this is a truly intuitive device. Checking your levels outside of the doctor’s office won’t seem like such a chore anymore. Wrap it around your wrist, and you’re off! A handy blood pressure cuff can become a trusted asset. Pregnant women use them to monitor for potential complications. People trying to lose weight can get a good idea of their resting heart rate and blood pressure using a device on a regular basis. And folks tackling high blood pressure for any other medical reason find comfort in using a machine they trust every day. 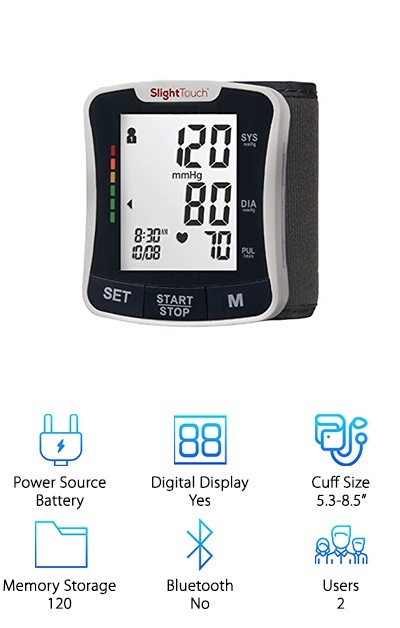 The iProven Blood Pressure Monitor gives positive benefits to many, and that's why our reviewers picked it as part of our top ten. You'll get accurate, consistent heart rate and blood pressure readings with this wrist cuff. It will fit anyone with 5.3-inch to 8.5-inch wrist diameter. It's big enough for easy reading of the LCD screen but small enough that it can be tucked into a bag or purse when you're done. The built-in memory function stores your last 60 readings. It uses the same color indications as the American Heart Association, too! The best manual blood pressure monitor around is going to be highly functional and long-lasting. That’s why the Santamedical Aneroid Monitor is such a hit! 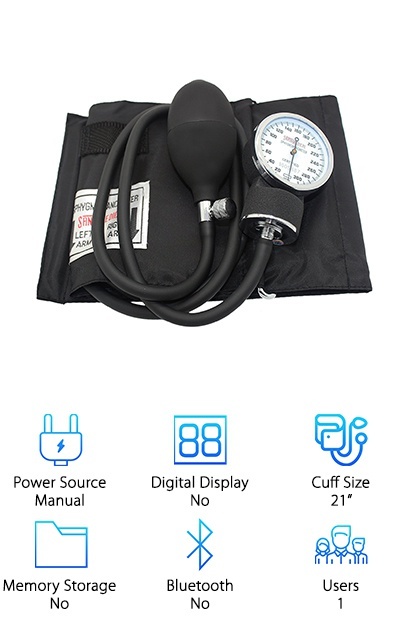 Technically, this is a sphygmomanometer (say that three times fast!) That means it’s the classic, manual BP monitor you see in your doctor’s office or the hospital. Many health professionals will tell you old-school is the way to go because the readings are so accurate. It's also extremely durable. Made from PVC and Velcro, with a heavy-duty clip and chrome-plated valve, the cuff and attached parts are crafted according to American Heart Association standards. The cuff is 21 inches long, so it will fit even the biggest upper arms. That's several inches longer than most automatic monitors. What's the best part? The only thing you need to get started using the Aneroid Monitor is a stethoscope! It fits into its compact carrying case easily and can go everywhere that you go. Medical professionals love solid sphygmomanometers like the White Coat Deluxe Aneroid monitor. Why? Because there is nothing to plug in. No batteries to replace. No buttons to push. This is the same kind of manual monitor you see being used by EMT's, nurses and others. That doesn't mean you need to be an extra to use it – quite the opposite! The White Coat Deluxe Model is a great deal and a quality product. It has a classic black nylon cuff, an aluminum alloy manometer, and the 2-tube adult-size PVC bladder. It comes with some extras, too: a carrying case, and an LED penlight with a pupil gauge. You just need a stethoscope, and you’re good to go. Keep track of your own health or the health of loved ones with this sturdy, long-lasting medical-grade device. It can help to give you peace of mind. That’s why our reviewers are such big fans of this affordable product!